A sense of comradery can be felt whenever one wears pop culture-themed apparel or accessories. Pop culture magically has the capacity to bring complete strangers together. Say, for example, you're walking down the street wearing a favorite Teletubbies shirt and a complete stranger passes and sees your awesome shirt. Most likely they'll high-five you and say, "I love those Teletubbies, man!" See, you just made a new friend by advertising something you like. Extend this sentiment by wearing a slightly more outrageous accessory on your face for all the world to see. 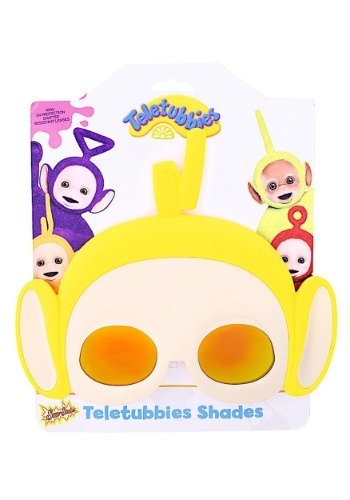 Next time you take a stroll down the street, wear these hard-to-miss Laa Laa sunglasses and see how many new acquaintances remark on these Tubby shades. We have a feeling they'll be quite the hit in your neighborhood! These officially licensed shades feature mirrored amber-colored shatter-resistant lenses which protect against harmful UV rays. (That's helpful when you're out walking on a hot day!) The lenses are fixed into plastic frames which also feature the yellow Teletubby's lightening-bolt dipstick. The shades cover a large portion of the face, creating a Laa Laa look-a-like! When pulling out all the stops is necessary, pair this costume with a complete Laa Laa costume. Luckily enough, we've got those too!